That just needs an FPGA to make it really interesting. +1 and some sort of embedded rpi type SOC for in the box development. I’d be all over that jazz. Too bad, I am killing our version of this thing as we speak (we only built 5 hand-made prototypes). Sure we planned a dump of FOSS ported forks+OHW back into the community, but someone beat us off the line and shat in the middle of the design standard with a defective design. We don’t care how it happed (most likely someone from jlcpcb.com group or security breach / Google-tracking), but we see similar idea dupes that reach Hack-A-Day feeds as already spoiled fun. You can buy mini-cluster MB kits very cheaply already if you know where to look. PM me if you cant find a PCB kit, and we can probably send you some of our surplus. If the Sparkfun one is done poorly, why would that prevent you from releasing a better version? I don’t really understand what you’re trying to say with this. We simply don’t invest our time and resources irrationally competing with people. Ideas have a way of permeating from various sources, or being drowned out by the ego of the indignant. I was offering an older model PCB to someone that genuinely could benefit from the fully-functional tested version we built, and a tip to find the better commercial version someone else disclosed at the end of the summer. I like people who build things, and support students when we can. However, the Hostility from some of you guys was astounding, and I am rather shocked by your behavior. I would still recommend using a different PCB supplier for your own projects for awhile, and avoiding something with obvious design errors. I know it may sound crazy, but maybe, just maybe, someone had the same idea at the same time without some google conspiracy happening.. It’s not reaaaally some super innovative neverbefore though of thing..
Is this sarcasm? The only way this missive makes sense to me is sarcasm. I’m pretty sure Sparkfun knows how to spin a simple custom board without hacking anyone’s project. If you think you can do better, prove it? Unless you’re a big enough company to both apply for patents and successfully sue people who infringe them, you JUST CAN’T get upset about copycats or simultaneous inventors in small scale hobby electronic dev business. You just can’t. I’ve been in this type of business for 8 years. One of my more profitable products has had competitors pop up at several companies in the same space, and also cloned at 1/5th the price by China. Still sells. 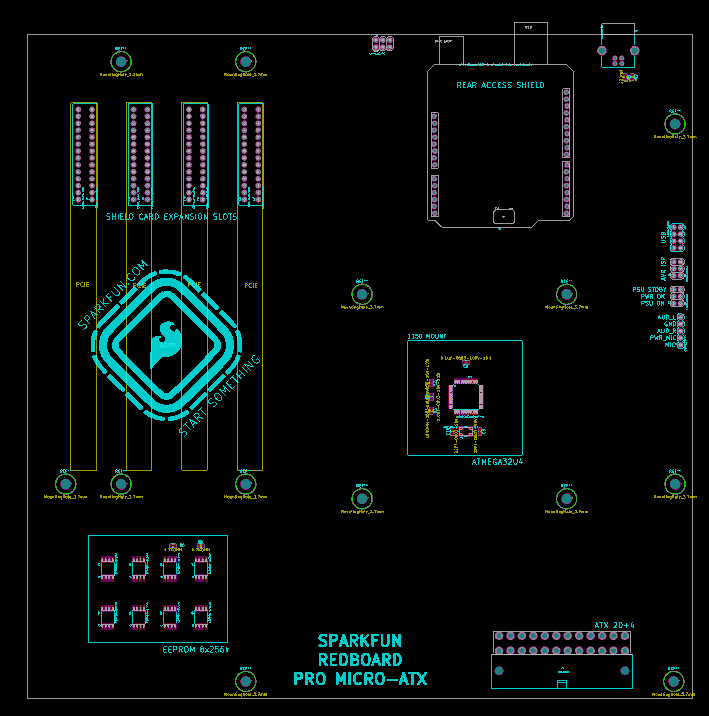 I call companies like Sparkfun and Adafruit colleagues rather than competitors, because that’s what they are. They bring a lot to the community that more than compensates for any product similarities or rehashes, and there’s plenty of B2B stuff between those two major suppliers and many small-scale electronic design companies, too. My disappointment tends to arise when people copy the exact flaws we left in a design on purpose to help identify corrupt supply chains. We don’t sue people because it is dumb, but do avoid offenders and their associates as part sources. It is fairly rare with established businesses, but has happened exactly 4 times over 15 years. Spark-fun is useful and Ladyada is sublimely awesome (we are not even 20% that cool), but we are too small to move anywhere near that kind of volume. We simply must cancel projects if others clone something we intended to be FOSS/OSH, as it wastes even more time and budget. I would hire you simply for your honest character and intelligence for example… even if we don’t necessarily agree on industrial best-practices. Genuinely curious…where do I find out more info about your work? This whole idea has me a bit fascinated. Also…not really sure how to facilitate a PM. A google search for your username just brings up that silly gingerbread man. Anyway, happy holidays! Hey, any of those PCBs still available? Not sure how to PM you. For a home Training machine, I’m surprised that you cant buy a Stratix 10 + Quad A53 linux box, with several 256 FPGA’s in vector arrays fed by 512GB of GDDR5x in an ATX form factor. You would really just need a USB3 header for front mounted access and 2 PCIE 16 slots to drop a HDMI GPU into to sound and video out, and a PCIe SSD. I wouldn’t play games, but it would be a tensor crunching, Etherium mining, deep learning BEAST. GB or MB? 512GB feels slightly outside the range of a home setup…but hey, I’m out of my wheelhouse on this one. GB. Of you are spec’ing a motherboard, Gddr5x is just a BGA socket on the board. Since you would have a lot of room, you could put a lot of chips. I’d even look at putting m.2 slots on the board, and using gddr5x chips pin riser cards in between fpgas. I’m actually really, really surprised no one is trying to make these kinds of things, as ML is going to be a absurdly huge demand in the workplace in the next few years. Is it just me, or is watercooling the board gone beyond “nuking the planet just to make sure” and gone full into “nuking the entire solar system just to be sure”? Weir: You destroyed three-quarters of a solar system! McKay: Five-sixths, but it’s not an exact science. Weir: Rodney, can you give your ego a rest for one second?! Thanks for quoting one of my favorite shows ever! This site needs both a thumbs up and an edit feature. +1 for a show that was gone before its time. more importantly what is it cooling? wait nvm, zooming in cleared that up. The cheapness and availability of cases sells the idea. Some of which are quite nice, and versatile. Fyi, the article calls the project the “redboard” but the redboard is actually sparkfun’s in house flavor of the Arduino. Why would you waste that much real-estate? And he didn’t want to add extra RAM “because you’ve got to draw a line”? What a weird place to draw it, when you’re already being ridiculous then why not add the RAM? It’s just SRAM and SPI, digikey has a nice 20MHz 256kbit SRAM in stock at about USD 1. Perhaps it was a bit difficult to get the compiler to utilize it natively? Because when you’ve already chosen to ignore “that’s ridiculous” as a reason to stop, there’s no reason to pick any other given stopping point. But you still have to stop somewhere so that you can get it made. Like many of the projects we feature here on Hackaday, “why” is probably not a question you want to dwell too long on. Only the stuff that’ll cause an extinction event. Did you see the article on my 64 cell USB battery bank? Asking why on this site is like asking if the sky is blue. Some things you just don’t do. And I thought the 60 cell battery pack for my DC UPS is big. It’s LiFePO4 32700s, though. Rayleigh scattering, is why the sky is blue. What would have been ideal is high speed muxes/shift registers to give you a whole bunch of input/outputs, plus pin expanders, maybe a 16channel 16bit dac, an SPI addressible MOSFET array for high current drive (to actually USE that atx psu) plus the ability to use megas. Throw in 8 relays and you have a multipurpose dev box. Also watercooling the controller is just nuts. 2 megaBITS? What is this? A Super Nintendo? Why not a SDXC slot or other connector for some decently large storage? The article makes it sound like more just wouln’t squeeze in. To be fair, the Arduino platform could really use more storage space and processor capability. Mega 2560 does just that and opens up a LOT more hardware options. Heck would be pretty interesting to rework a Mega 3d printer -based board into a Mini-ITX board so motor drivers could be on decent sized boards instead of postage stamps so popular with that crowd. I can store more on 5 1/4″ floppy. There is a slot so you can add a floppy controller. If that edge connector + pinout gets adopted as a standard, then others could make boards like this with better utilization of the board area. A bad idea whose time has come !!! To be fair, his computer is on a par with my first PC XT in terms of expansion and raw CPU power. He did drop the ball a bit with the absence of a 555, which, with a piezo, would be ideal for CTRL-G.
A metal ATX case contains enough material to build 10 or 15 *ino or *Pi cases, but barely costs 2x or 3x, or nothing if you get one in a landfill. Whoever invents a 3D-turbo-encabulator capable of cutting and folding the former into the latter is going to sell some of them (read as: shut up and take my money!). Here’s an idea for the next 555 contest, watercooled in an ATX case. Make that 555 out of high voltage MOSFETs and IGBTs, then run it from rectified mains. Just upgrade then transistors and you will be set. Make the 555 out of the hydraulic logic gates from the cooling system. I was rather thinkingbin the line of making a 555 out of arduinos. I like the idea of easier expansion management, it would have been nice to see it done to a MEGA 2560, basing it around a Uno / Leonardo form factor seems very limiting. Hey people this is Xmas, not april’s fool! Are you sure your calendar is pointing to the right holyday? +1 That was my thought too. It’s an April Fools joke if it was trying to tricking you into believing something that wasn’t real. In this case, Nick actually built it, published the design files, and is/was giving away the extra PCBs left over because of PCBWay’s minimum order. To me, it was a an Xmas gift of amusement and joyous spirits–I was entertained. For some reason, I would have been more interested if someone dropped in like 64 Quad core ARM SoCs running at a GHz or two, with 2 or 4 GB of RAM each, and with decent 1 Gb/s networking binding the nodes together, all in this microATX form factor. Could have been more fun to poke a stick at compared to something that an over sized perfboard and a few hours of someones time could have done. Other then this, always nice seeing people come up with new creative boards. Well, that is an interesting choice of device. I would recommend going for something a little bit cheaper to be fair. Though, the 36 Gb/s serial data rates that chip provides seems like it could be of use. Not to mention the 1.5 GHz ARM CPU as well as those millions of gates as well. I will take a guess that having 64 of these on one board will be considered crazy by most people. Run it as the vector processor, and use an array of smaller fpgas that run 8bit tensor matrix math. On an ATX board, you could easily put 16 smaller fpgas with supporting gddr5x ram. It would be like having a dozen Google TPU’s in your desktop doing machine learning with a Linux desktop. It’d be nice if the front and/or back panels had some banana jacks, screw terminals, or other quick-attachment arrangement. Good point, and it would still fit with the PC case “theme”. Maybe a module that fits in the obviously unused optical drive bay that has a couple LEDs tied to GPIO and some jacks. Like a general purpose I/O panel you can get to from front of the machine. Add a 20×4 characters display *AND* a 1.8″ TFT 160×128 LCD and we’re getting somewhere. One of my older 286-based PC got the banana jack treatment, though I just ran +12 and +5 to jacks mounted on a blank floppy panel. I could definitely see doing this for a ZE footprint stm32f4, the one in a 144pin QFP.